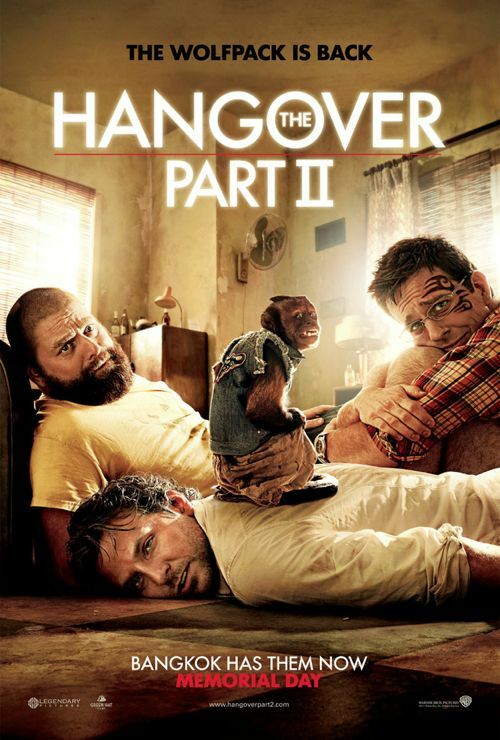 Warner Bros. has released the poster for The Hangover Part II and it looks like another round of insanity that is sure to leave us in stitches…..
A follow-up to the record-breaking hit comedy The Hangover, the sequel finds Phil (Bradley Cooper), Stu (Ed Helms), Alan (Zach Galifianakis) and Doug (Justin Bartha) traveling to exotic Thailand for Stu’s wedding. After the unforgettable bachelor party in Las Vegas, Stu is taking no chances and has opted for a safe, subdued pre-wedding brunch. However, things don’t always go as planned. What happens in Vegas may stay in Vegas, but what happens in Bangkok can’t even be imagined. The movie lands in theaters on May 26th, so get ready!